IndieVolume is a supplement to Windows Volume Control that dramatically improves the way Windows applications sound.IndieVolume is for experienced Windows users dreaming about those handy features Windows Volume Control is lacking for years per-application volume, per-application balance and mute, support of FX, support of multiple audio devices, etc. IndieVolume has all that functionality. With IndieVolume you get the most out of your audio.IndieVolume allows every application have separate volume level, independent from other applications volume level. For example, you are listening to the music, and suddenly some application LOUDLY shouts or dings. With IndieVolume you just configure shouting application to sound at different (lower) volume compared to the volume at which player application is playing music.Bespoke per-application volume, IndieVolume also supports per-application balance and mute. For example, you have occassionally visited one of that websites, that play horrible sounds in the background. Using IndieVolume you can just mute web browser not to output any sound at all. Or you like to play flash games and would like to control volume level. IndieVolume can do that as well. How to Use»IndieVolume is extremly useful for VoIP applications. When application marked as "exclusive" plays a sound, IndieVolume automatically mutes all other applications. 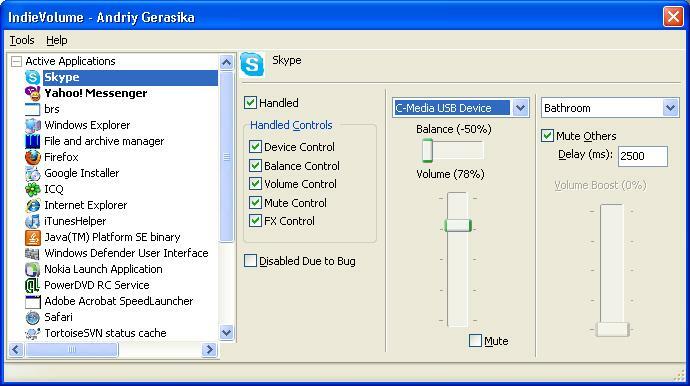 For example, you are having business chat in Skype or GoogleTalk, and suddenly some application plays a sound. With IndieVolume, you can mark Skype/GoogleTalk as "exclusive", so none application would sound during your Skype/GoogleTalk calls. How to Use»IndieVolume allows per-application selection of playback device. For example, if you have built-in sound card and SoundBlaster as second sound card, or USB/Bluetooth headset, you can configure certain applications play on built-in sound card, and others play on SoundBlaster or USB headset, fully employing your audio hardware. See above information and user's reviews about IndieVolume IndieVolume offers per-application volume and other audio settings.